I called this chapter ovals, and not circles, because drawing a perfect circles is actually rarely required in a drawing. Just as with rectangles, you’ll encounter lots of distorted and modified ovals when trying to draw 3D. A perfect circle takes time to get right, even when drawing from the shoulder. Small circles are okay, but if you need large ones it’s best to just draw a quick and loose oval, and later on use the eraser and small strokes here and there to adjust it. I have to say, though, that organic shapes that seem circular (such as the head) are often slightly stretched circles, or egg-like shapes. Try to look closely at your object to see how it actually looks. The degree is named that way for a good reason. It represents the angle at which we look at the circle; for example, a large degree means the ellipse is a circle, and we’re looking at it in perfect side view. 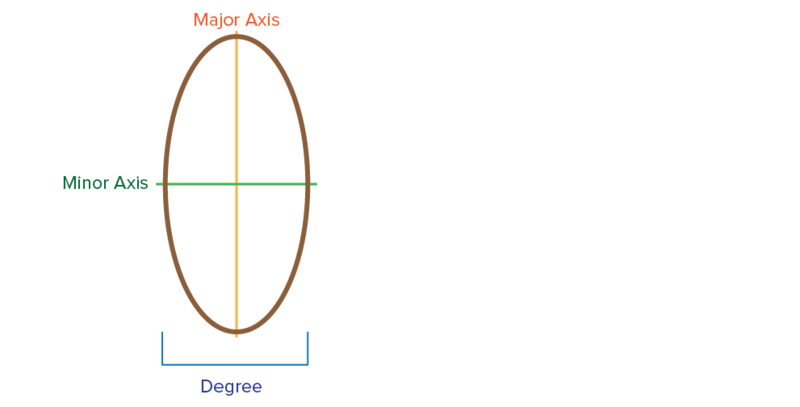 A small degree means we’re looking from a large angle, and we see a hugely foreshortened circle. To illustrate this further, we can draw a circle within a rectangle, and then rotate the rectangle (using our knowledge from last chapter). Notice how the circle becomes an ellipse with decreasing degree. Just as with rectangles, we can subdivide our ovals into multiple parts. Again, the easiest way to accomplish this is by drawing a rectangle around it, and subdividing that. The point where they intersect is the centre point of the oval, and you should have a circle with 8 equally big parts. Now, these contour lines help you to draw a pie, but don’t seem to have much more use than that. However, if we relate these contour lines of the flat oval shape to a 3D object, we can easily create the visual illusion of depth and form. I call this the umbrella method. Again, simple exercises I suggest you do daily, or whenever you have some time to kill. Draw ovals at different sizes. They don’t have to be perfect. Try to keep the ovals smooth, and especially try to end the line exactly where you started. Last exercise was a loose one, with this exercise you try to draw perfect circles and ellipses at all angles/sizes. 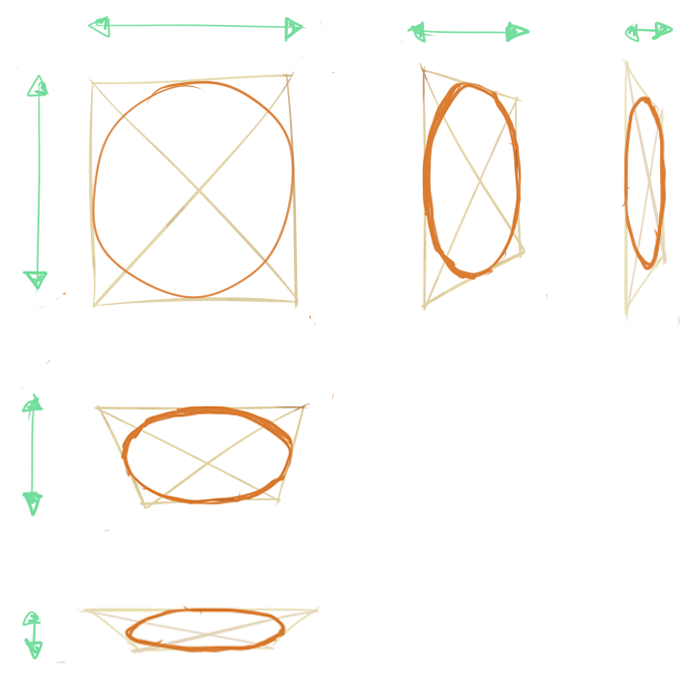 Simply draw any of the shapes from the previous exercises. Now, trace over that exact shape again and again. Start slow, but aim to trace your shapes as fast as possible. Draw anything that combines all the previously discussed shapes. Especially useful, I think, is to draw ovals inside rectangles, or vice versa. What happens when you use controlled, tight drawing from the wrist?